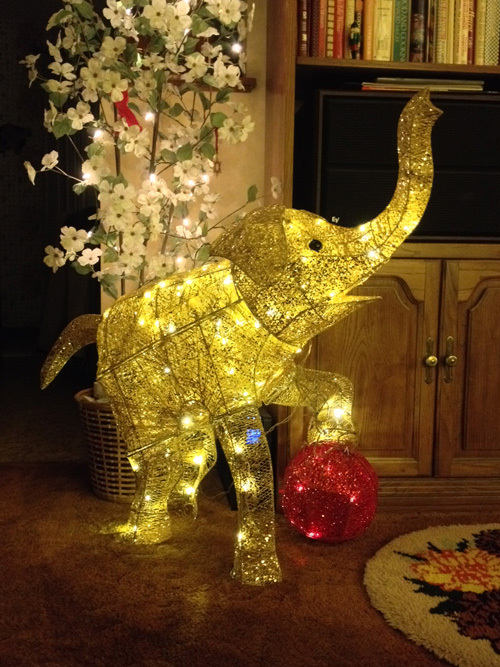 You’ll love to have this gorgeous glowing Gemmy Sparkle Elephant in your home or, if you can, set her outside for the holidays. She’s nearly baby elephant size, measuring 39 in. tall to the tip of her upraised trunk and approx. 40 in. long from trunk tip to tail. Sparkle glows an elegant gold color lit by 70 LED lights that are pre-wired and is standing on a red ball that flashes. Sparkle is being auctioned on eBay as a fundraiser for Friends of the Asian Elephant hospital in Thailand, the world’s first hospital just for elephants. Since 1993, they’ve treated more than 3,600 elephants for everything from minor injuries and illness to pregnancy & maternity up to elephants who have even lost a leg stepping on a land mine. They are entirely supported by private donation. So please be generous with your bids. 100% of the winning sales price will be donated to FAE. Now, you must hurry to place your bid because the auction is already in progress and will end on Monday, January 12 at 8 PM Central Time. View the eBay auction and place your bid now. Good luck! Update: January 13, 2014: Congratulations to Jody Stickney for having the winning bid on Sparkle the elephant. Thanks to everyone else who participated in making this fundraiser a winner for FAE. This entry was posted in Fundraising and tagged auction, eBay, elephants, FAE, Friends of the Asian Elephant, fund raising, Sparkle on January 7, 2015 by johnshepler.